The War Reserve collection in the University Library, initiated by Librarian Francis Jenkinson, contains a wealth of interesting things for the military researcher, ranging from regimental histories and public school rolls of honour to weekly casualty lists. Alas, this collection is still only found by searching a card index catalogue but during my time working in the UL I have been lucky enough to work in Rare Books and have access to this collection at the shelf. I once chanced across a slim nondescript volume containing a letter and various items pasted in to form a larger work. This must have been twenty years ago but the memory of the contents of the volume has stayed with me. 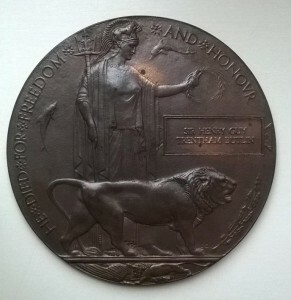 In late 1917, with direct input from King George V, it was decided that in addition to the respective campaign service medals awarded to all participants, the official next of kin of a serviceman or woman who gave their life should receive another more specific token of appreciation. This was a big call, and one to easily get wrong; after all, it is impossible to thank the individual concerned, and nothing can make up for the loss of a loved one to their family. 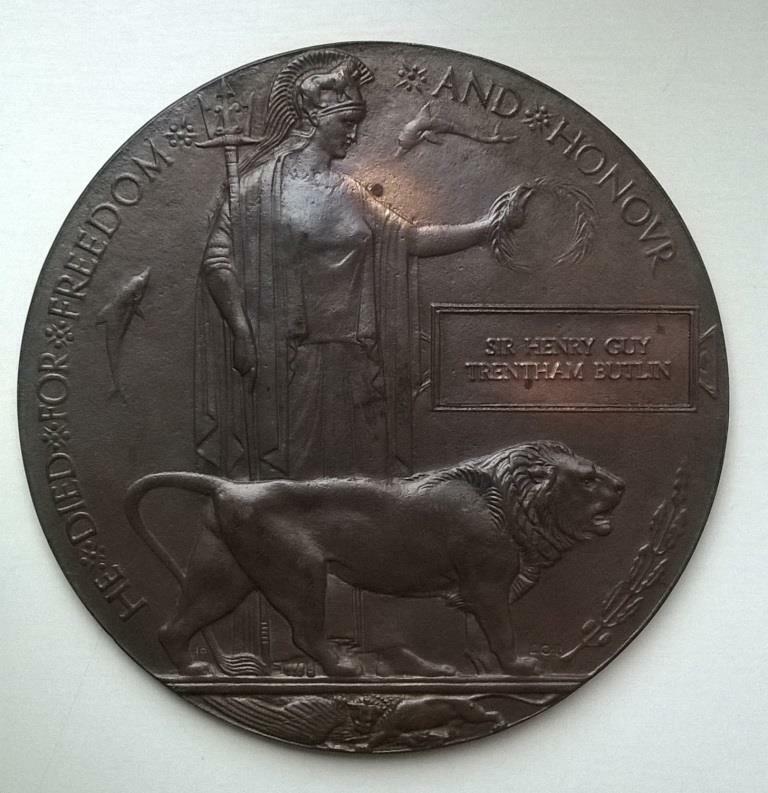 The conclusion was that a bronze Memorial Plaque should be issued and a national competition was declared to find the most suitable design. The panel of judges, which included Directors of the London National Gallery and the Director and Keeper of the Department of Coins and Medals of the Victoria and Albert Museum, finally selected a design by Mr Carter E Preston. In all, approximately 1.3 million Memorial Plaques were issued to the families of men who died, and 600 issued to the families of the women. 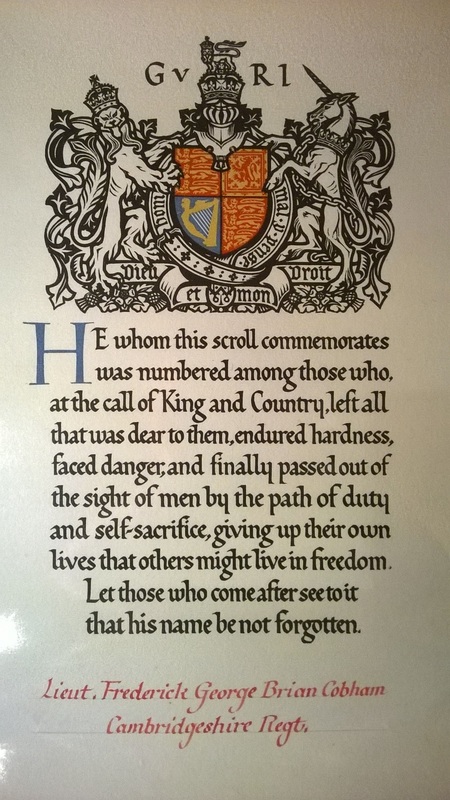 A decision was made that the Memorial Plaque should be accompanied by a commemorative scroll and the organising committee sought advice on the wording from several well-known authors. Dr Montague Rhodes James, better known as M.R. James, Provost of King’s College at the time and respected author, provided a draft which, with a few small amendments was selected to appear on the scroll. The text appeared beneath the royal coat of arms and above the name of the honouree which was handwritten in red at the bottom. WRB.44.315 is the contents of package sent to M.R. James by the Government and pasted together to form a volume. It contains a covering letter, written by a Vincent Badderley addressed to James as Mr Provost and offering him “copies of some of the acknowledgements that have been received of the scroll containing the sentiments you kindly composed”, a sample of the scroll and the seven typed copies of letters received by the Government from the families of those who fell during the War and who had received a plaque and scroll. Although all are heartfelt messages, one perhaps stands out from the others, and is aimed directly at James. We desire to thank the Authorities concerned for the Memorial Scroll in reference to our dear boy and to say how greatly we appreciate not only the kindly thought that has sent it but the beauty of expression used by the author of it. During these centenary years there will be a huge amount of research undertaken about the War and its aftermath, and many primary resources consulted and I hope this small volume, detailing perhaps M.R. James’s least known, but possibly most important work, is among them. Guest post by Robin James, English Cataloguing Department.